It made law and pulled our industry out of Punjab to neighbouring states. 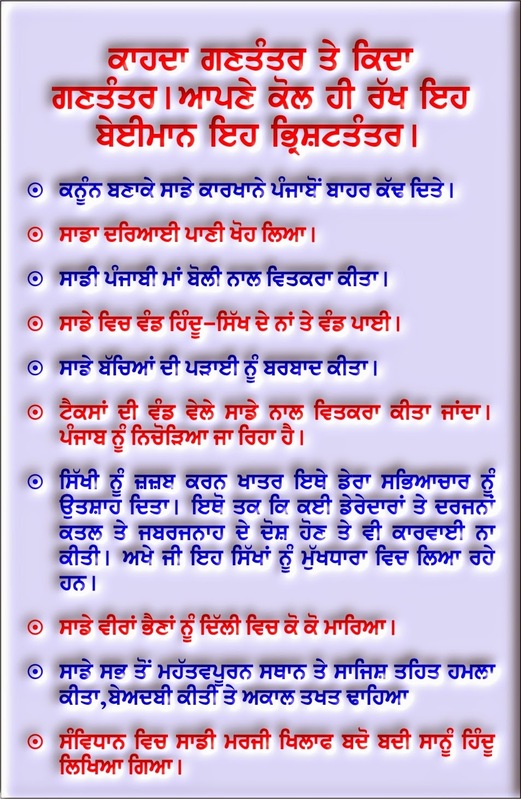 It has worked on the policy of divide and rule in Punjab. It created a wedge between Hindus and Sikhs in Punjab. It destroyed our education system through a conspiracy. It has launched secret programmes to absorb Sikhism into Hinduism. It encouraged raising of hundreds of gurudoms. Some of its created pseudo-gurus are so corrupt and criminal they have allegations of murders and rapes against them. The Govt does not take action against them, "because they are bringing Sikhs into mainstream (read Hinduism)"
They massacred thousands of our brothers and raped our sisters in Delhi in 1984 and have not punished the guilty till date. Reason obvious. They conspired to invade holiest of our holy places the Golden Temple and demolished Akal Takhat. Despite our protests its constitution brands Sikhs as Hindus. So when you work against the wishes of people you can't be called a democracy.